Poh Heng Jewellery is one of Singapore’s leading jewellers with a long history and a reputation for being relaible, the most trusted name perhaps in gold. 22 carat or 916 and 24 carat or 999 gold. I worked on the brand for more than ten years, starting when I first came to Sinagpore and joined Asatsu DK, then called Nexus-Asatsu. I was part of the team that created Poh Heng’s relaunch campaign in 2001. The objective was to attract younger customers, however without alienating the existing base of loyal older customers. I wrote the new tagline for the brand and the press campaign, which was translated to television. Poh Heng still uses the tagline: Nothing is quite as precious as trust. This particular campaign here was designed and started about four years ago. In a market very uncertain, with worries about a downturn in the air, Poh Heng decided to leverage its strength in gold, something consumers could still believe would withstand the market pressures. 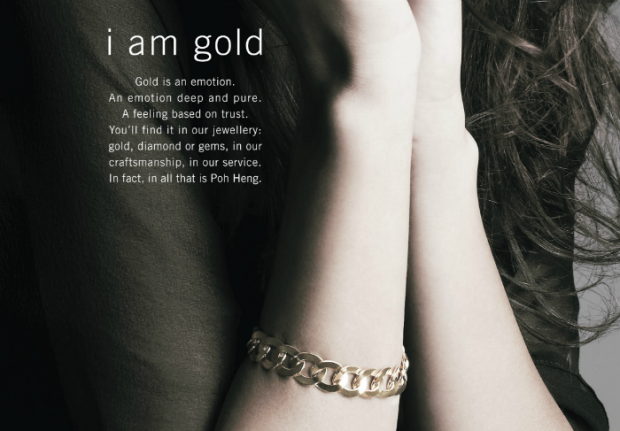 We suggested making gold part of Poh Heng’s brand personality… going beyond just gold as a metal used in jewellery and exploring the inherent essence of gold; owning it. And subliminally communicating to the reader there is perhaps that beauty of gold in her as well. Here are three ads from the first “I am gold” series, the campaign is still running. Copy: Gold is an attitude. An attitude carved by challenge, moulded with trust. You’ll find this attitude in all our jewellery: gold, diamond or gems, in our craftsmanship, in our service. In fact, in all that is Poh Heng. I am gold. Copy: Gold is an emotion. An emotion deep and pure. A feeling based on trust. You’ll find this emotion in our jewellery: gold, diamond or gems, in our craftsmanship, in our service. In fact, in all that is Poh Heng. I am gold. Copy: Gold is a passion. A passion that glows within, filled with beauty and trust. You’ll find this passion in our jewellery: gold, diamond or gems, in our craftsmanship, in our service. In fact, in all that is Poh Heng. I am gold.